The sun begins to shine through the two foot gap I’ve left in our cabana’s curtains somewhere around 6 am. For the first time in months, sleeping in is an option. At least an option. Breakfast is at 7:00 and our guide, Daniel, will be ready by 7:30, but he’s gone out of his way to let us know he’s moving on our schedule -- and so the opportunity to catch another hour or two of rest before hitting the flats is there, even if it’s one we’re decidedly unlikely to seize. Bonefish tail on the home flat (photo: Chad Shmukler). But the Turneffe Atoll’s bonefish have other ideas. Still flat on my back, I squint towards the increasingly confident flood of sunlight, trying to catch a glimpse of the palm trees outside in an effort to determine whether last night’s stiff wind has subsided. Light gleams sharply off the water that slaps against the seawall not more than 40 feet from the cabana’s porch, forcing my still bleary eyes to recoil. Rods and cones do whatever rods and cones do and, my eyes a bit more ready, I peer out again to spy the palm’s fronds. Now capable of some measure of focus, my gaze is once again caught by the glittering light, which my improved vision now realizes is the glint of the sun’s rays off the tails of a school of feeding bonefish. Before I realize it, I’ve propelled myself from under the covers and stand peering through the cabana’s glass doors at what must be twenty bonefish tailing not more than 60 feet from my door. As I scan the flat, I discover two other pods of tailing fish not far in the distance. For anglers that spend most of their time plying fresh water, where fish populations are relatively small and less diverse, saltwater fisheries often seem like a world of limitless bounty where one only needs to wade in from the shore and toss a line in the water in order to claim its gifts for ourselves. To some degree, this is true, but in reality seeking out the fish we typically pursue in the salt requires chase. Striped bass follow bait. Tarpon migrate. 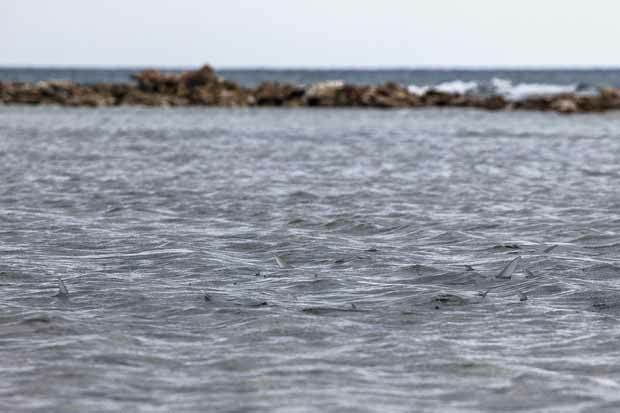 Permit and bonefish move on and off the flats as the tides fill and purge them of water. And we chase. 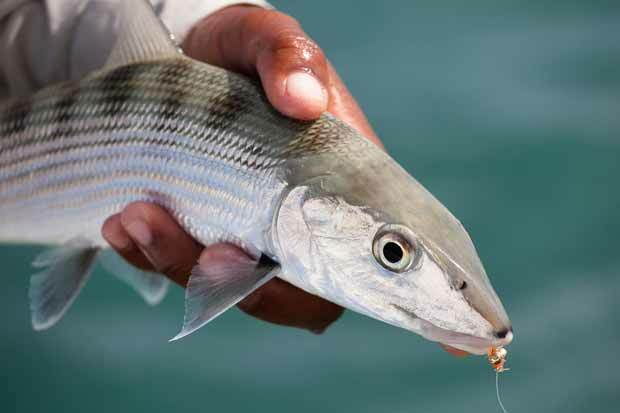 A healthy Turneffe Atoll bonefish (photo: Chad Shmukler). Put more simply, saltwater anglers expect to find fish, not to have the fish find them. Each day starts with the loading of gear into the boat and a run, whether long or short, to where the fish are. 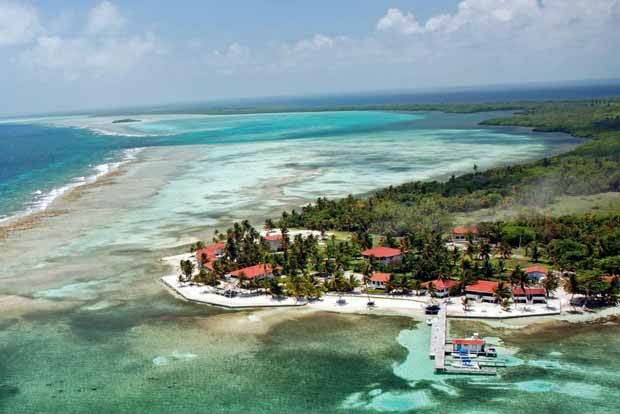 But at Belize’s Turneffe Flats, which sits squarely along an expansive flat that has aptly been dubbed the “home flat”, the fish find you. Hell, if you’re dumb enough to leave the curtains open, they wake you up in the morning, drawn straight from some angler’s fantasy of the world’s best alarm clock. As if the presence of the home flat isn’t enough, thanks to the Turneffe Atoll’s meager tides which vary only around 10 inches throughout the day, the flat is never dry. As a result, the home flat’s bonefish are resident fish. Instead of moving on and off the flats as the tides give and take water, these bonefish never leave, spending their days entirely on the flat plucking crabs and shrimp from the coral and turtle grass which line its floor. The bonefish are always there, teasing you with their tails, and the 10-inch shift in tides sometimes bring permit. And so the home flat is always calling, whispering in your ear like a cartoon devil. Get up early. Keep those flats boots on after the boat pulls back into the dock for the day. Be a little bit late for dinner. Turneffe Flats and the home flat, seen from above. It looms as an ever-present opportunity to to log more hours hunting the fish you’ve trotted the globe to find. It also offers up consistent chances to hone your flats skills -- spotting nervous water, spying tails at 200 yards, getting a feel for the mood of the fish and how to target them -- with the benefits of your all-seeing guide removed. The flat is very often the bookend to long, storybook days spent exploring the Turneffe Atoll. It’s the chase, extended, even if it’s right at home. 2 registered members (Marty, 1 invisible), 233 guests, and 9 spiders.